Uploaded a video from today to youtube showing a partial cloudy midday. Moving on to show individual color and colortemp adjustment and then a thunderstorm in the end. Don't forget to switch to 1080p in the clip. Enjoy! Sweet build! 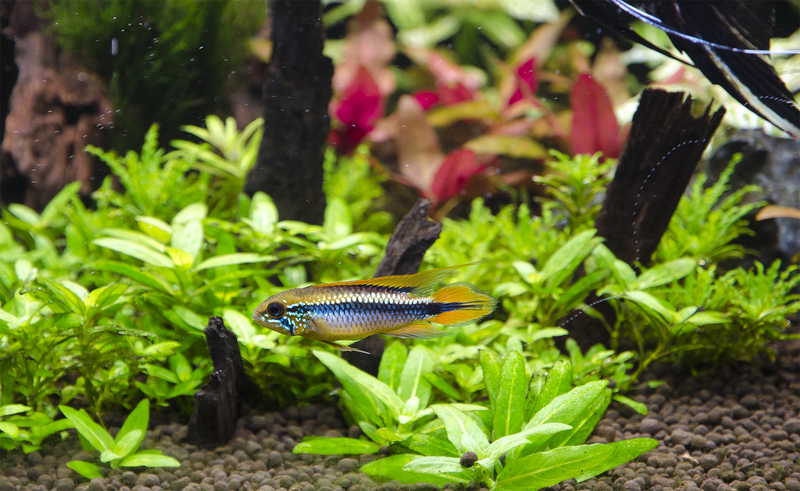 Looks really nice on that tank, apistos popping too how that aggie and cac getting along? BettaBettas and BettaBettas like this. Your fish are going to need SPF 3000... Nice build. Colors are amazing. Location: "Out West, in the Land of Fruits & Nuts"
Beautiful tank! The colors are gorgeous! 225 Gal, Glass "Reef Ready" w/ dual Iwaki Pumps & 2 Ocean Clear inline filters. Makers 72" heat sink w/ 12 NanoBox V3 led arrays, custom built CC drivers. All controlled by a BlueFish "mini" Led Controller. , and a 20lb CO2 system w/ Milwaukee Ph Controller. so are you finally convinced that "just" ww and cw is not quite enough??? and to Fissure for setting the "bar" soo high.. I'm still sticking w/ cyan vs lime though.. Very nice. I'm playing with overcast clouds too for my LEDs. I'm using an Arduino 12-bit pwm to control an LDD-H. The overcasts are on regular intervals for convenience but I'd make it random sometime. LOL- NOPE & He had some help with that bar. Modded both powersupplies now and replaced the stock fans with 120 mm Noctua fans. Thing is dead silent when the fans activate, really nice. Had some noise coming from an inductor belonging to the driver running the violet LEDs that had a cracked casing/shield, resulted in some vibrating noise when dimming. Dripped som thicker type supeglue on it and the sound went away as the glue got hard. Going up too 700mA on the leds sure resulted in some additional heat making me wonder if a heatsink this size is pretty much necessary for this much light, at least if you are gonna run it passive. At 300mA the heatsink felt cold to the touch but now it is slightly warm to the touch on the fins. Somewhere around 40 degrees C (104 degrees F). Going through my first day cycle now, starting with a morning period that is slightly dim and has a slight green/yellow tint with a touch of red. 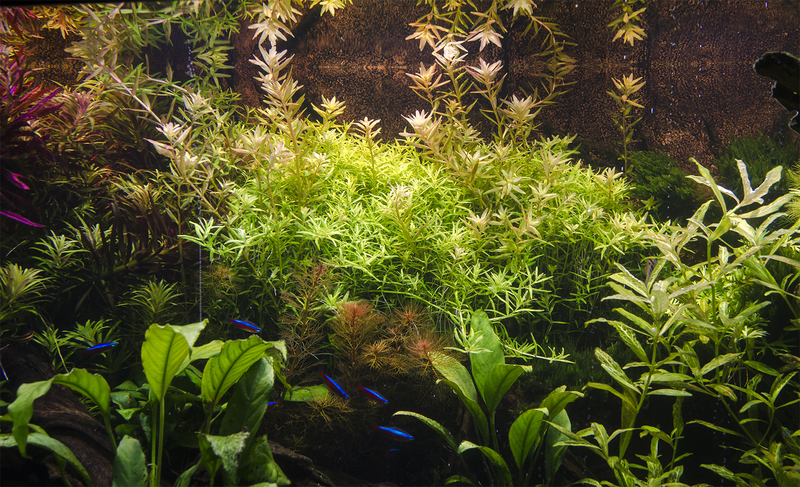 Pearling from the plants during this period were moderate. Now it is in the late stage of the midday cycle and man the pearling is crazy. Coming from everywhere and FINALLY my Micranthemum 'Monte Carlo' is pearling (and the pearling is goooood). Also the first time I see my Alternanthera Reinecii variants pearling. Turning of the pump for 5 minutes and just watching all the bubbles raise up in a straight line is so friggin calming. Feels good getting some sort of confirmation on the build resulted in something better for the tank. Currently the controller is fetching the weather from Manaus in Brazil. A City right next to the Amazon River which is kinda cool. It is partially cloudy today, kinda nice with the cloud effect in the tank. Only negative I have right now is the 3000K leds in the back. It is a tad to yellow back there. Will probably replace those 4 leds later with something a bit cooler. 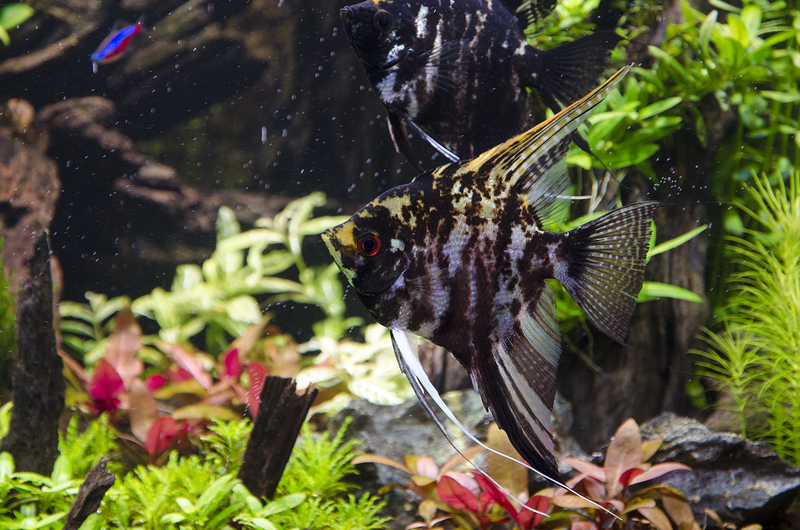 Also now during the midday cycle I noticed the Angelfish and tetras being a bit lower in the tank, still not hiding but not acting like they used to. Might be to bright in the tank or they just have to acclimatize to the new light. Kinda hard to now where to draw the line where it gets to bright for the fish. Rest of the tank inhabitants do not seem to care, minding their daily business. Move the warm whites closer to the cluster. That will fix the spotlighting. Lime was never meant to replace cyan. They make the tank look brighter without affecting color temp. Right the limes were meant to replace green.. cyan's.. in this case are arguably better. Since it will fill the gap and be just as "bright" as a lime.. though of course a toned color.. However, in the absence of highly efficient green LEDs, Philips Lighting has taken a different approach with its Hue color-tunable bulb. Instead of a conventional green device, Philips Lighting has based the green element of Hue’s RGB light engine on a lime-green LED from Philips Lumileds’ Rebel ES family (Figure 2). The lime-green device is not a pure-color LED, rather a combination of blue emitter and proprietary lime phosphor that overcome the efficiency problems of green devices. According to the Philips Lumileds’ datasheet, this blue LED/green phosphor combination is capable of an efficacy of up to 190 lm/W (2.75 V, 350 mA). Well it has been almost two weeks now with the light running over the tank. Had some smaller issues with the bluefish controller but it turned out I had set it up in a way that the software did not like and it bugged out. Got that sorted out quickly though with some help from the creator of the controller. Other than that the unit has been working flawless. The growth of the plants is crazy and I am not having any major algae issues yet. Some small amount of BBA on the driftwood close to the surface on some spots. Will treat that with hydrogen peroxide next WC. The tank as of today. Image is a bit dark since it is sunrise time in the tank. Had issues with the growth of the Pogostemon erectus with my old light. Growing really fast now. 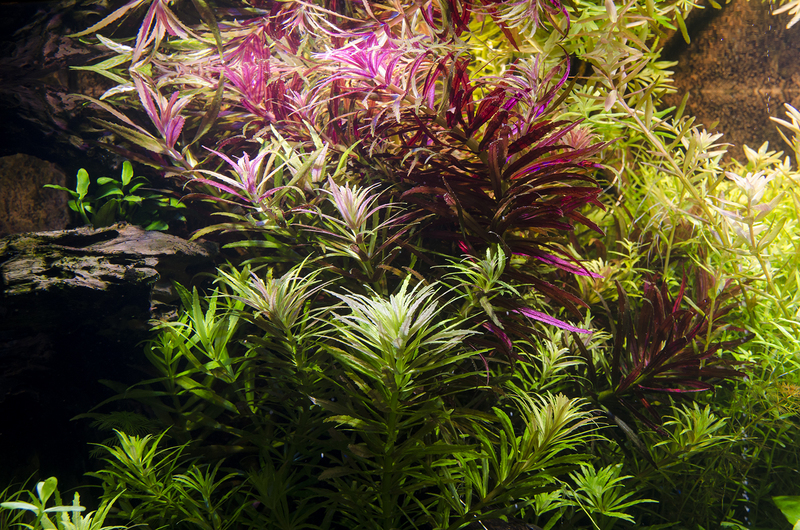 Mix of Rotala sp. ‘Green’ and Rotala rotundifolia, the rotundfolia is finally getting the red-brown color I wanted. 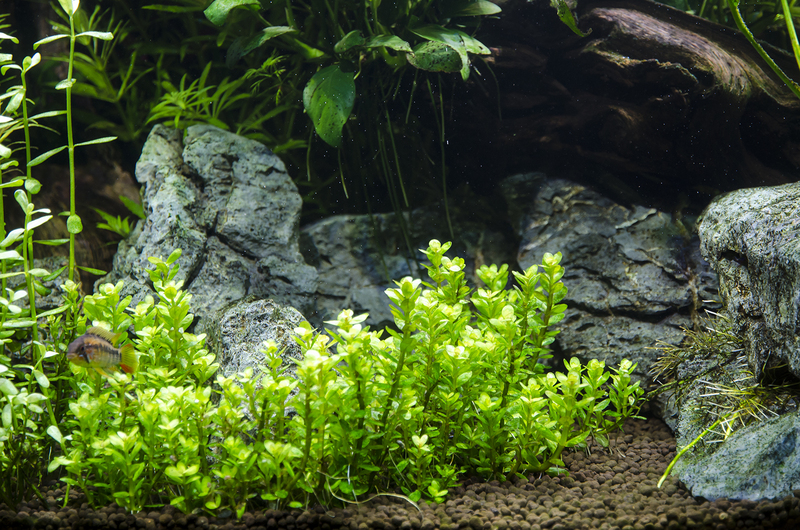 Mix of Limnophila aromatica and Limnophila hippuridoides. The reds in hippuridoides is really nice. The picture does it no justice. The green in the aromatica is really intense and a nice contrast to the reds/purple in the hippuridoides. Trimming down the aromatic when it starts going red/brownish. 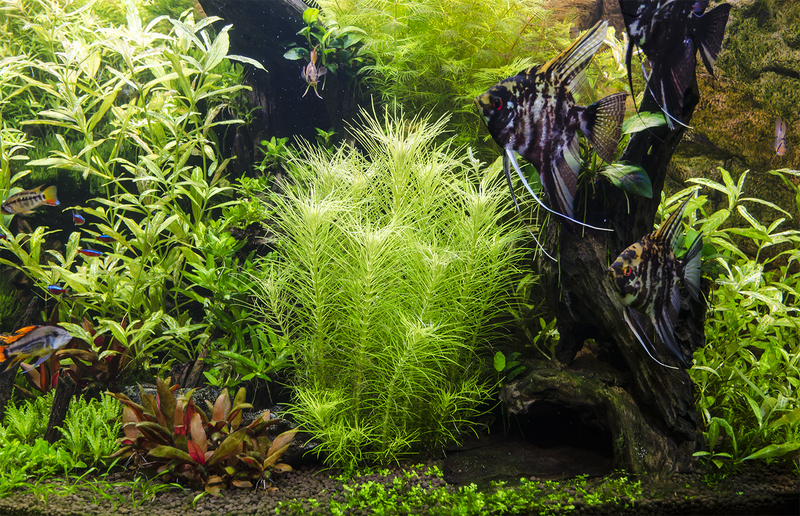 Rotala 'Bonsai', also had issues with it being stagnant and lower part of the plant melting. It is starting to recover. Soon time for some serious cutting and replanting. Tried running the unit at max power at 1000mA on all the leds (except the ones that only can be run at 700mA) without clouds and a fast sunrise. Checked the heatsink temps after 9 hours and it was actually pretty hot. Measured around 50-60 degrees celcius. Makes me think a really big heatsink actually is required to be able to run this passively. Promised to write up the costs for this project and will start doing so now will update the first post when I am done. Holy cow batman!! That's pretty amazing. Damn man that is some insane growth in 2 weeks. You have basically built the ultimate planted LED. What are your color settings?